If you are ready to contact us about our various Service Dog programs, the fastest way to reach our Service Dog division directly is fill out our 30 second quick application on the left hand side of this web page. Once you press "Send" your contact information gets routed directly to our Service Dog division, where we'll be able to provide you with a Price List as well as a way for all your Service Dog questions to be answered personally by one of our Service Dog Specialists! 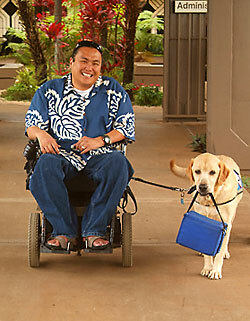 Dogs have proven their usefulness to humans for centuries, and no more so than in becoming service dogs. 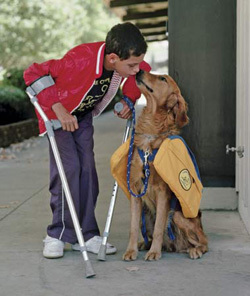 Knowing what it takes to have your dog trained as a service dog, and more importantly designated as a service dog, will make your life much easier no matter what your handicap. 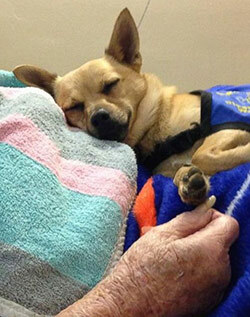 Karma Dog has created the first of its kind Hospice Dog program in the country where current Karma clients can take their own personal dogs to help a person going through the transition process from this world to the next. Open to past and current clients alike, we keep the requirements simple. Advanced level training is not necessary, just the basics. If our client's dogs can help people in this way, it's a wonderful way to give back to the community. As Jeffrey Brian states, 'There's nothing more important to me than giving people a sense of peace about the transition process. I truly believe that this life is but a dream and when we die, all we're really doing is being born back into Heaven."